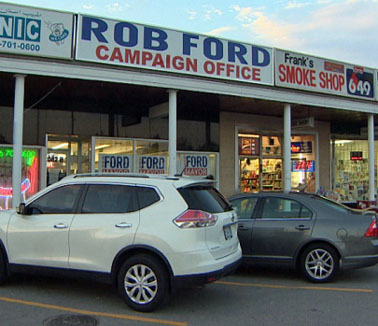 All who are worried that Rob Ford might actually be re-elected Mayor of Toronto this coming October 27, 2014 have been able to take fresh courage from the latest Nanos poll on the subject. This involved a telephone survey between August 27 and 31, using a random sample of 1,000 Toronto voters. Among those already decided 42% said they’d vote for John Tory, 28% for Rob Ford, and 26% for Olivia Chow. One of the biggest surprises of this poll — and the general pattern of similar surveys since the middle of the summer, say — is the continuing weak performance of Olivia Chow. She used to be the clear front runner, back in the spring. Olivia and Jack, riding the streetcar. In the now vanished golden age of the Toronto New Democrats ?? Photo by Tania Liu, from the Torontoist Flickr pool. It’s one thing, Mr. McParland seems to be saying, for John Tory’s old protege (and current Ontario Liberal cabinet minister) Mitzie Hunter to campaign for him — from the start. 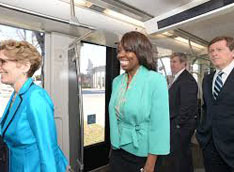 But recent support from Ontario Liberal infrastructure minister Brad Duguid is raising the bid much higher. The Wynne Liberals in some quite generic sense, as Kelly McParland sees things, have now virtually endorsed the former Ontario Progressive Conservative party leader John Tory as the next Mayor of Toronto. 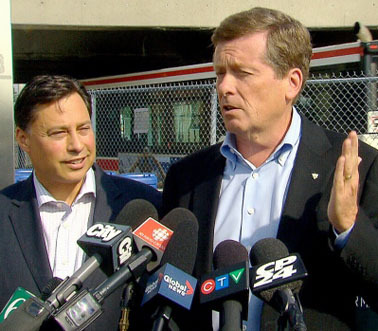 Ontario Liberal infrastructure minister Brad Duguid endorses John Tory — and, it would seem, his public transit infrastructure policies. 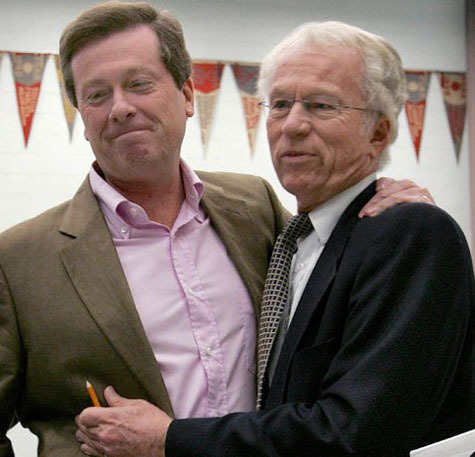 John Tory (l) and his father John Tory Sr. on election day in Ontario 2007. The elder Mr. Tory passed away in the spring of 2011. 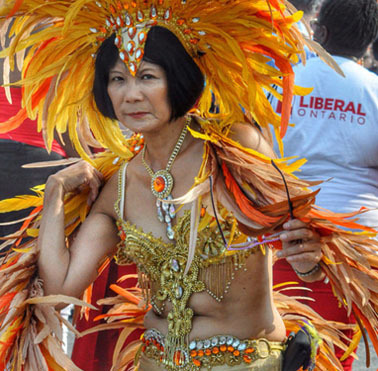 Olivia Chow at Caribbean Carnival, August 2014. 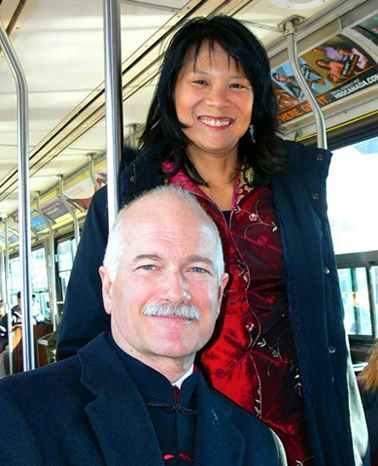 Personally, I still believe I will be voting for Olivia Chow. She is the most beautiful candidate, whatever else you may feel about the NDP these days. But I definitely do not want to see Rob Ford win again. And I am already foregoing my heart’s favourite mayoral candidate, who doesn’t stand a chance, the saxplayer for the taxpayer, Richard Underhill. 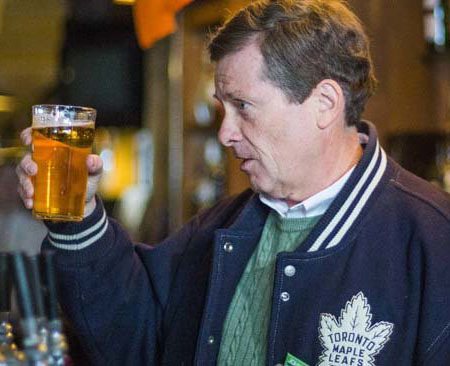 In any case, I am starting to think that, after so many years of nobly trying, maybe there’s actually a good enough chance John Tory will finally win an election to public office in what the Old Upper Canada has become (the Canadian Province of Ontario 2014), and begin a no doubt distinguished enough career as Mayor of Toronto. 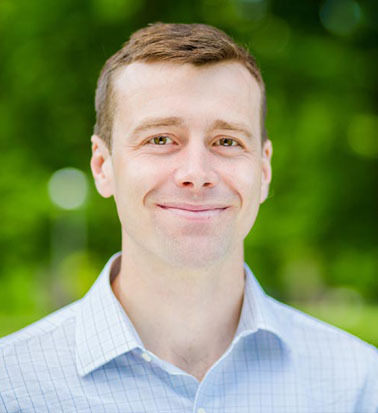 Alex Mazer, as he appears on his website!